Today I take an in-depth look at the refresh of a lens that has been part of the Micro 4/3 system for a rather long time. 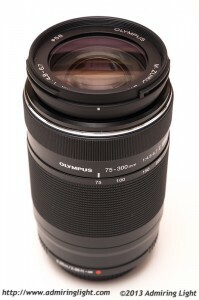 Olympus first announced the original 75-300mm lens for Micro 4/3 in September of 2010. That lens was priced at a rather insane $900, significantly more than the competing Panasonic 100-300mm lens, but without optical stabilization. After a time, Olympus has seen fit to replace the original version with a new version, while reducing the price significantly to $549. Optically, the new M.Zuiko 75-300mm f/4.8-6.7 II shares the same design as the original lens, though there is some debate as to whether there have been improvements in coatings or refinement in the design. The biggest change is the new exterior, which is a much more pleasing all-black shell with a fine double ridged zoom ring grip that goes quite well with the newer Olympus cameras and lenses and looks particularly good on the OM-D E-M5. Let’s see if this lens is worth the now lower price of entry. 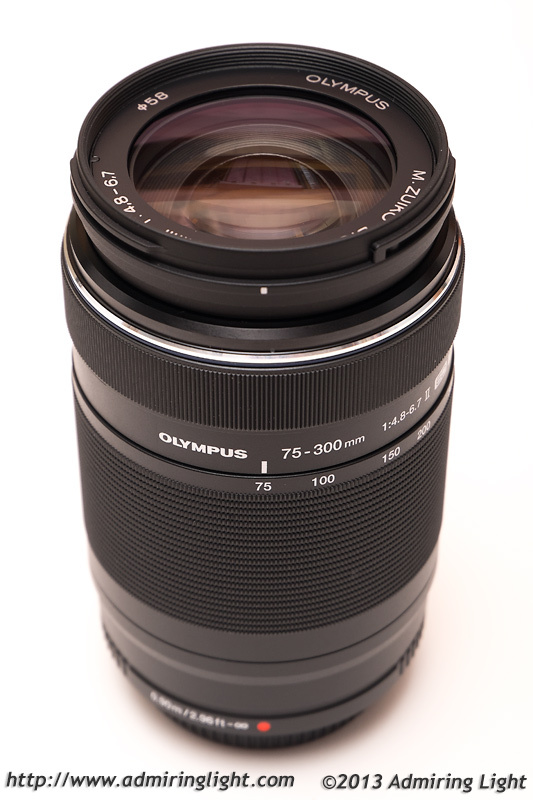 The new Olympus 75-300mm II is a nice looking lens. I mention this primarily because its predecessor was probably the ugliest lens in the Micro 4/3 system and looked incredibly cheap. While version II is still predominantly constructed of plastic, the aesthetics lend a much more sophisticated and higher end look to the lens body. Despite having a mostly plastic barrel, the 75-300mm II is a well constructed lens, with tight tolerances, a very smooth zoom action, no wobbles on the extending portion of the lens and a nice (though not very damped) feel on the focus ring. The lens has a metal mount and a metal ring around the end of the non-extending portion of the lens, just above the focus ring. While one of the largest lenses for Micro 4/3, the 75-300 II is actually quite compact and lightweight for a lens with its focal range. Considering the smaller Micro 4/3 sensor, it’s extremely compact for a lens with its field of view, which is equivalent to a 150-600mm lens on a full-frame camera. This is some serious reach in a relatively small package. 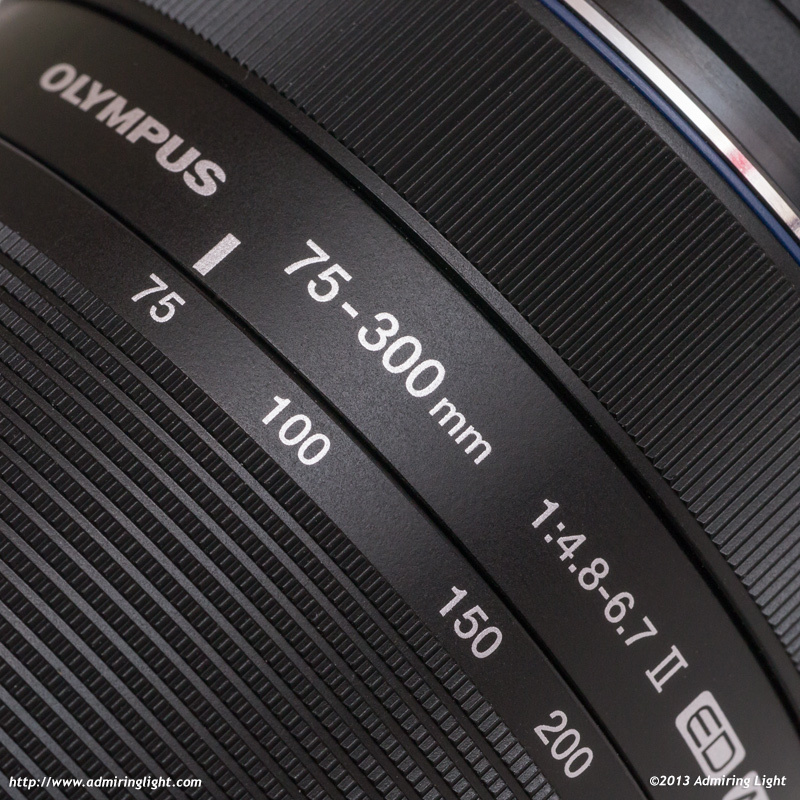 Like all of Olympus’ lenses, the 75-300mm II doesn’t come with a lens hood, though one is available to purchase separately. As I’ve mentioned in all my Olympus lens reviews, I find this practice of not including lens hoods rather ridiculous, as even many bargain lenses from other manufacturers come with hoods. The lens features a standard external zooming mechanism, so the barrel extends while zooming towards the longer end. 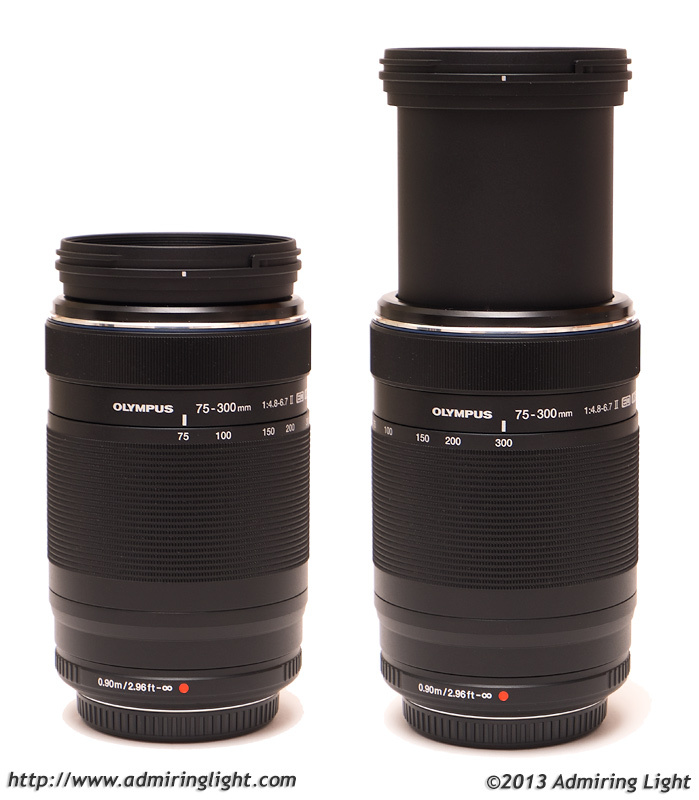 When fully extended, the 75-300mm gains about 2 inches in length. Being a larger lens, the 75-300mm II handles best on a camera with some sort of grip, whether that be one of the Panasonic G series cameras or the Olympus OM-D E-M5 with extra grip. When used with one of those cameras, the 75-300mm handles very well. It’s relatively lightweight and the zoom action is very nice and even, without any points that stick or stutter. Since the 75-300mm lacks any sort of optical stabilizer, you will need good light for handholding on a Panasonic body, and I’ve found even with the excellent in-body IS of the E-M5, you need pretty good light even using Olympus bodies. One thing that appears to be an issue with the 75-300mm II is that is succeptible to shutter-shock with the OM-D E-M5. That is, in mid range shutter speeds of 1/100s to 1/300s or so with this lens, there is some shake induced upon shutter release. This can be predominantly solved by setting the camera’s ‘anti-shock’ setting to 1/8 second, which will introduce a minimal delay when shooting (feels like a slower exposure), but eliminates the shake issue with the lens. Otherwise, I found the E-M5’s in-body IS to work quite well with this lens, down as slow as 1/50 second at 300mm. The autofocus of the 75-300mm is essentially silent and very quick. Generally, when shooting at closer subjects, say 10 feet and closer, the autofocus is very accurate. I have noticed that it does struggle for precise autofocus at times on longer range targets, especially of smaller subjects. It’s one of the few Micro 4/3 lenses where I will have a handful of out of focus shots when I offload my card after a shoot. what would be really useful is a comparison between this and the Panny 100-300. I’ve recently rented both lenses to shoot baseball games in challenging light (for both lenses.) Even after using both, I’m still torn which to buy. DxOMark is saying this Ver. 2 is appreciably sharper than Ver. 1 and, now, slightly sharper than the Panny. Panasonic can also be had now for $450 and includes the hood. The difference is only a third of a stop and thus any increase in noise is going to be minimal. 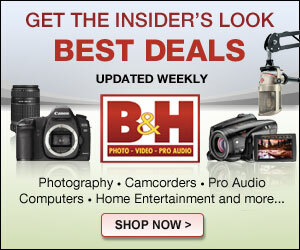 I plan on getting a review sample of the Panasonic 100-300 and I will do a comparison when that comes in. No guarantees on when…..I’ve got the GX7 and some other lenses yet to review in the queue…..
At 100mm the Panny is f4. The Oly is 5.1. You’re shot of the Egret is excellent. I’m surprised at the bird’s sharpness even at 300mm. I always enjoy your reviews and am glad I’ve found your site. Keep up the excellent work. I’ve tested both lens versions. The “ugly” overpriced original lens is sharper all around. That should count for something. The new version looks nice but the older version is a little sharper. 150-600mm equiv range in a compact lens intended for daylight shooting while actually not requiring an assistant “mule” is a good thing (with either version). Should users of the old version jump to get the less expensive new version? 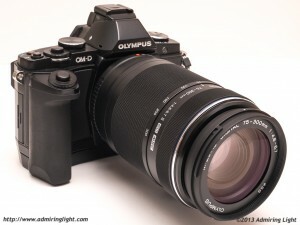 Not until a detailed comparison between the Panasonic 100-300mm and the latest Olympus 75-300mm is offered up. That lens could top both Oly models. I don’t think you can say either version is sharper than the other without exhaustive testing of many copies of each. Simple sample variation is enough to sway on some of these. I’ve seen reports saying the new version is a little worse (yours…which is the first one that I’ve heard said that), I’ve heard reports that they’re identical, and I’ve read tests that say the new one is sharper….which to me says they’re identical optically in design, and any differences are down to sample variation. Well, both old and new versions might have some variance, but for me the new one was significantly better, especially in high contrast scenarios. Consequently I sold my old 75-300, of course at a huge loss. The only significant change too the new lens are the new coatings, so I would expect the new ones to be generally better than the old ones. However, variance in lenses can cause a different experience. Yeah, I can say that about sharpness. I tested a new version and found it lacked the performance of my old version. I can own one version. I choose the sharpest one. Individuals have to make those decisions, which will differ from testing labs possibly handling several lenses probably none of which they end up owning. maybe i bought a very good exemplar. my lens is sharp even at 300mm. but you need good light and have to stop down to f/7.1 or better f/8. but image quality is very good at 300mm for me. i used a tamron 70-200 2,8 before with also good IQ, but it was very slow an noisy. for me the oly is the better lens overall although you cant compare them. I recently bought 75-300 mm lens to use with my OMD-EM1 system in Jan 2015. (Note: I used to own the OMD-EM5 and this same lens but all was stolen in April 2014). I never had a problem when using the zoom all the way out on this lens even in low light on a tripod. With this lens extended all the way out, I hear a very loud shifting noise like an element is loose? I am unable to focus on SF or manual. The warranty technician has said all is ok. I am asking they review the lens more. I am new to the 3/4 system so I have no idea of the internal working parts on this lens. What parts could come loose in manufacturing. Do i have a lemon? 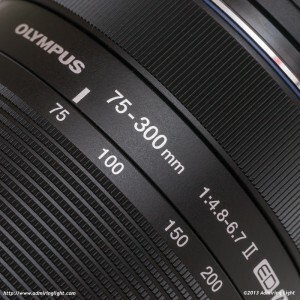 Is there problems with the newer version of this lens and the OMD-EM1? Thks for the reviews. Between Olympus 75-300 and 40-150mm for best sharp if I don’t need more than 150mm? The 40-150 f/4-5.6 or the f/2.8? If the former, they’re similar in image quality, so I’d save the money and size. If the f/2.8, it’s the better optic, though much larger. For what I have read, the 40-150mm probably has similar quality as this one, but, just like the 75-300mm, it loses quite a bit at maximum focal length. So if you pretend to use mostly the 150mm range, the 75-300mm should be much better as it will be in its peak.